On the bench or in the field, you ll have the right screwdrivers for your gun in one compact, go-anywhere package. We precisely matched each gun s screws to the correct Magna-Tip® bits to give you the best possible, blade-to-slot fit. Except where indicated otherwise, each set comes with a magnetic socket, Hollow Handle for easy, on-board storage of the bits. Four bits to fit side plate, grip, thumb latch, and rear sight elevation and tang screws. SPECS: 8" (20.3cm) long overall. 1¼" (3.2cm) diameter grip. På benken eller i feltet har du ll de høyre skrutrekkere for pistolen din i en kompakt, overalt pakke. Vi tilpasset hver pistol s skruene til de riktige Magna-Tip ® bitene å gi deg best mulig, blad-til-spor passer. Unntatt der annet, kommer hver settet med en magnetisk socket, hul håndtere for lett, innebygd lagring biter. Fire biter å anfall siden plate, grep, tommelen sperren og bak synet høyde og tang skruer. Spesifikasjoner: 8"(20,3 cm) lang samlede. 1¼" (3.2 cm) diameter grep. This set of bits are good quality, but were useless for the side plate and crane screws on a 1999 640-1and a 2016 340 M&P. The tip thickness of the 150-3 included in the set is too thin to properly fit the screw notches. The only Screwdrivers and bits I use to work on Guns. These Brownell bits are superbly crafted and fit all my S&W revolvers, from J-Frames to N-Frames. Plus, they fit many slotted fasteners on my rifles too. 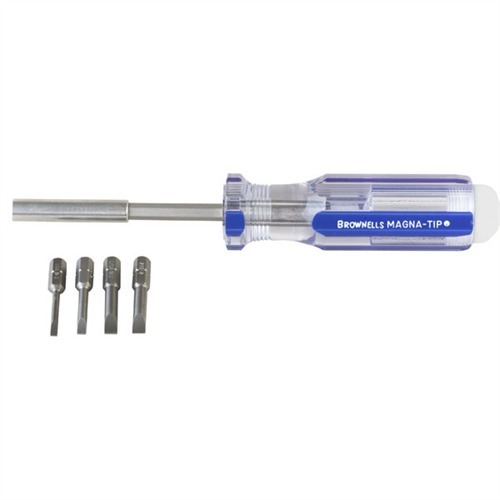 I'm so impressed, I'm going to order a complete Brownell's bit set. On the very first screw, a side plate screw, the screwdriver tip bent and buggered up the screw head. Very dissappointed! My armored courier company very recently began issuing semi-automatics. But before that, everyone brought me their guns to clean. This 4-in-1 screwdriver let me clean and lubricate everything on our model 64's easily and without damage to the weapons. If you're doing anything with a S&W revolver, you need this. I like the bits and the handle and the idea of including a set up the most used bits for a S&W revolver. The problem is, the MOST used bit for my N framed 625 isn't included. None of the included bits properly fit the yoke screw (which appears to need a 180-4 bit. Some of the bits that are included don't seem to fit anything on my revolver. They may be for a different frame size. But, the kit should have the proper yoke screw bit for each frame size. Purchased this set for my S&W 460 and 500. The smallest bit seems to have no real use for my S&W X-frames, the other bits are excellent for the side plate and cylinder release screws. The larger bit is good for the grip screw but somewhat undersized. Overall an excellent product! 4-in-1 Combo På benken eller i feltet har du ll de høyre skrutrekkere for pistolen din i en kompakt, overalt pakke. Vi tilpasset hver pistol s skruene til de riktige Magna-Tip ® bitene å gi deg best mulig, blad-til-spor passer. Unntatt der annet, kommer hver settet med en magnetisk socket, hul håndtere for lett, innebygd lagring biter. Fire biter å anfall siden plate, grep, tommelen sperren og bak synet høyde og tang skruer.